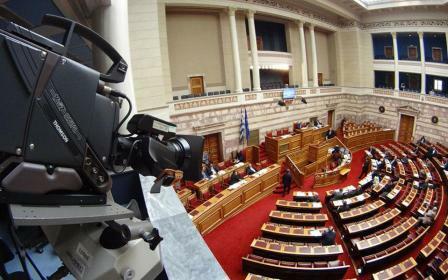 Greek MPs approved on Tuesday night the 2018 budget following a debate between party leaders during which New Democracy chief Kyriakos Mitsotakis challenged Prime Minister Alexis Tsipras's claim that Greece is on the road to recovery. The result of the ballot saw 153 coalition lawmakers vote in favor of the economic plan and 144 opposition MPs against. Tsipras hailed the budget as the last that Greece would have to execute while under an adjustment program. The SYRIZA leader argued that the country is already on the road to economic recovery and that this would continue next year. “This year is the first with real growth after many years of recession,” he told Parliament, arguing that his government is leading the country to a stronger recovery than the New Democracy-led government in 2014. “We took over a country with empty coffers, with unemployment close to 27 percent, with zero trust among its partners and the international markets, and with the 10-year bond yield at almost 8 percent,” he said. Mitsotakis described the budget, which introduces almost 2 billion euros in new fiscal measures, as “unjust” and said it would undermine Greece’s growth prospects. 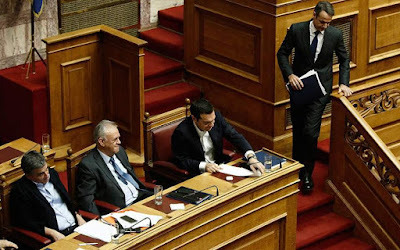 He also labeled the government’s assertion that Greece would be exiting its bailout next year as “Mr Tsipras’s new big lie.” He argued that the coalition had already committed Greece to a fourth program. “We will only have a clean exit from the memorandum when we do what Cyprus, Ireland and Portugal did when they left their programs without preapproved measures, without suffocating surveillance and without a commitment to achieve exhausting surpluses,” said the conservative chief. Mitsotakis also accused the government of beating this year’s primary surplus target through high taxes, confiscations and the reduction in social and investment spending, rather than from the economy beating expectations. “Why do we have to produce larger surpluses than those demanded by our creditors?” asked Mitsotakis, who accused the government of intentionally beating fiscal targets so that it could engage it handouts, “copying the worst clientelistic methods” of the past.